The word comorbidity refers to the simultaneous presence of two persistent health issues or more happening simultaneously with the first issue. Hearing loss, is the third most common medical condition in the US and has been connected to other health issues, some of which I've already mentioned early. The connection between untreated hearing loss and development of dementia and Alzheimer's disease is clear. The famous John C. Hopkins University study reflects that people who put off getting their hearing loss corrected may increase their risk of developing Alzheimer's disease by 100%, to 200%, to even 500%, if they are 65, 75 or 85 or older, respectively . . . Remember you hear with your brain, not your ears. 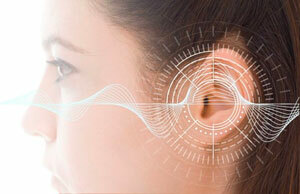 Hearing loss, filters out important sounds making speech unclear, confusing the brain. This confusion increases stress on your brain’s cognitive load forcing it to "guess", which adds to the deterioration of nerve's pathways. In 2011, researchers at Johns Hopkins University discovered hearing loss and dementia are connected, as more stress from straining to hear increases your cognitive load this can speed up your natural, age-related cognitive decline. Researchers monitored 639 subjects over 12 to 18 years, recording their cognitive and hearing abilities, and found that the worse the initial hearing, the higher the risk for developing dementia. On the other hand, a 2011, a Japanese study, discovered people who corrected their hearing loss earlier with properly fit hearing aids, experienced an improvement in their cognitive ability. Leading doctors are recommending more often now, that before you assume anyone may have Alzheimer's disease or dementia, get their hearing checked first. It may not be dementia at all, it just may be a chronic hearing loss needs to be addressed. I am amazed how many people we see, where their family and friends were convinced they were experiencing early onset of Alzheimer's disease or dementia and all it was was a hearing loss. Hearing aids can help you "turn the lights back on", so to speak, by simply lessening the brains stress levels and restoring a sense of environmental awareness again. Heart disease is the number one medical condition in the US, and it is also connected to hearing loss. Your circulatory system is vital your your hearing and nervous system, and as we've seen you need both to hear. High blood pressure and restricted circulation can further damage your hearing. Hearing loss have been connected to people suffering from cerebrovascular and/or cardiovascular disorders, as well as smokers. Often doctors are connecting hearing loss to medical problems with the cerebrovascular and cardiovascular systems. For example, diabetes is also medically linked to hearing loss. Because diabetes triggers higher blood sugar levels it can lead lead to stroke, heart attack, or hypertension. Cancer are also connected to hearing loss, due to the ototoxic (“poisoning of the ear”) drugs used in chemotherapy. For example, Cisplatin, a chemotherapy drug, has 69% ototoxicity at even tiny doses. Chemotherapy permanently damages your inner ear nerve cells. Always tell your doctor if you suspect your hearing is getting worse from your chemotherapy. There are several drugs that are poisonous to your ears, such as antibiotics and diuretics. Hearing loss has also been connected with depression, because social isolation is a factor for people who procrastinate correcting their hearing loss. As you know, prolonged hearing loss weakens speech recognition skills and the ability to understand speech in background noise, making you more likely to avoid social groups . This isolation and withdrawal from friends, family, and community. Untreated hearing loss may also cause higher levels of stress and anxiety., which inevitable will lead to depression. Properly correcting your hearing loss early on keeps nerve pathways for speech recognition healthy, while keeping you connected with your loved ones. Many of the causes of senior citizens falling and injuring themselves are preventable. Doctors routinely advise their older patients to excercise, have their vision checked. And monitor whether their medications are causing dizziness. In addition to these known factors to falling is untreated hearing loss, which has been connected in several studies to a significant increase in risk of falls. This information needs to be shared widely with people older than 65, along with encouragement to seek treatment for hearing loss as a part of an overall strategy to protect quality of life. USNews published a study in 2012, stated people with even a mild hearing loss (a 25-decibel hearing loss) were three times more likely to have a history of falling than those with no hearing loss. Every additional 10 decibels of hearing loss meant an increased 1.4-fold risk of falling. 1) People who can't hear well have less awareness of their environment. 2) Cognitive load increases for people suffering from untreated hearing loss. The brain can be overwhelmed with demands on limited ability to keep their balance and gait, while straining to hear and process what they hear. 3) Cochlear disorders may include vestibular dysfunction, leading to poor balance. The connection between hearing loss and increased chance of falling is concidered clinically significant.